Owing to inclement weather, the visiting Sri Lankan side has not been able to travel out of Dharamsala. 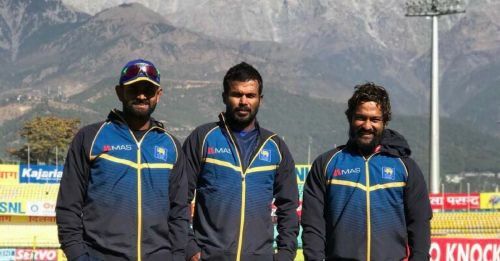 The Sri Lankan team has been forced to extend their stay in Dharamsala as the chartered plane which was to fly them to Mohali failed to take off due to poor weather conditions. “The team has returned to the hotel and is most likely to fly out tomorrow. This is the first time a team has been stuck here. There have been delays earlier but it has never happened that the planes have not been able to land or take off,” said Mohit Sood, an official with HPCA was as quoted by Hindustan Times. Sood also ruled out travelling by road as the Sri Lankan team preferred staying back and waiting for the weather to clear out. However, if the weather remains bleak, hitting the road will be the only available option. It must be mentioned here that if indeed the road route will be followed, the time taken to reach Mohali will be around 8-10 hours. The timings of the first two ODIs were changed and the starting time was brought forward by two hours keeping in mind the weather conditions. Thus, instead of the prevalent practice of starting the day-night ODI matches at 1:30 pm, the first two matches have been scheduled for an 11:30 am start to combat dew and fog. The second ODI in Mohali will be played on Wednesday, December 13 and thus if the weather remains to be bleak, the Sri Lankan team and the concerned officials will have to come up with a plan in order for the second match to start on time. After Delhi's smog, Dharamsala's extremely cold conditions will force people to question the scheduling done by the BCCI as there is no dearth of venues in the country and hence the ongoing discussions around the weather should never have sprung up if the BCCI took account of the weather before awarding the venues ofthe fixtures.